I like my chicken and my bacon and my pork and mutton and prawns and …you get the drift. So when I excitedly signed up for the Veggie Chic menu created by Chef Abhijit Saha of Caperberry, many eyebrows were raised. Is she turning vegetarian? Is she just coming there to mock us with terms like Ghas Phoos? And finally has she not read the menu? My answer to all the dear veggies – I just thought the Veggie menu looked exciting and why should I pass up an opportunity to be entertained by a culinary genius just because the menu didn’t have anything that walks, swims or clucks! Now that we have resolved the mystery of my presence at the dinner, let’s move on to important bits – the restaurant and the food! Caperberry means provocation of desire in Hebrew. It’s also really a berry as well – green and tart… but the earlier definition is more in tune with what the restaurant wants to achieve. Caperberry is located at the Tanishq building on Dickenson Road. You have to literally search for the name board before you enter, but a restaurant of such repute hardly needs to shout out from the mountain top! 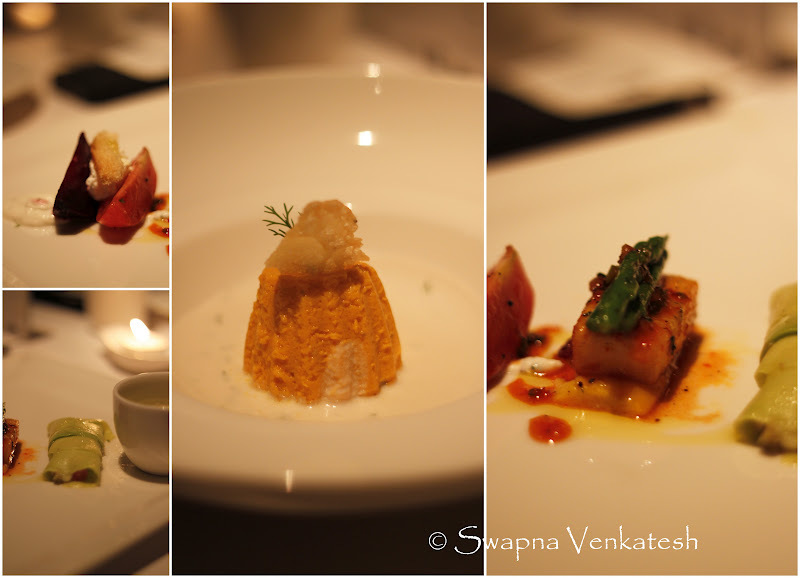 The restaurant is know as much for its food (molecular gastronomy), if not more so for its celebrity chef Abhijit. After this experience, I think he deserves the adulation! The Veggie Chic menu was an attempt by the chef to create a wonderful menu for vegetarians who are generally given the short end of the stick in fine dining spaces. The poor veggies need to always order the ubiquitous paneer or the more exotic broccoli or asparagus. The veggie section is almost added as a hasty afterthought and never has any gastronomical delights been attempted with the humble veggies. They are relegated to supporting cast or play hero only in a salad. Well, this menu was created to provide a happy comforter to all the veggie lovers out there – they can dine on exciting stuff and they can dine in style and finally someone attempted to wow them! There were 5 courses with 12 starring vegetables. 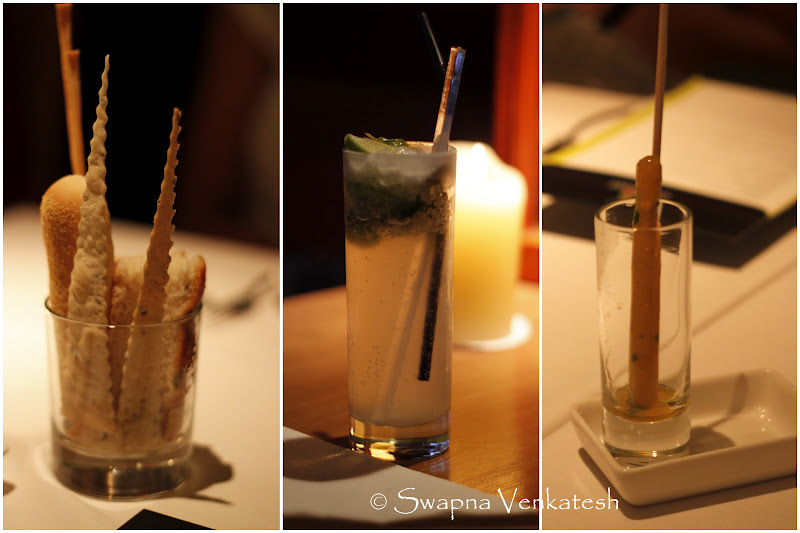 However Shruti Saha (head of marketing for Caperberry and also the chef’s better half) said there were a total of and 29 vegetables used to create the menu – I don’t think I’ve eaten that many veggies in my life… let alone one evening! The restaurant sure knows how to make an impression. As we entered we were served a Virgin Mojito. Not an ordinary one mind you. One emitting silvery smoke as it neared us. While we ooo’d and aah’d the waiter explained that it was the effect of liquid nitrogen and would we please wait till the fumes subside before slurping on the drink! A science nerd like me was doing happy summersaults. Once seated (a really elegant setting) we were served the usual suspects – A bread basket (or in this case – a bread glass) with some lovely roasted pepper pesto. Then came in the actual start of the meal – a Mango and Basil Popsicle. 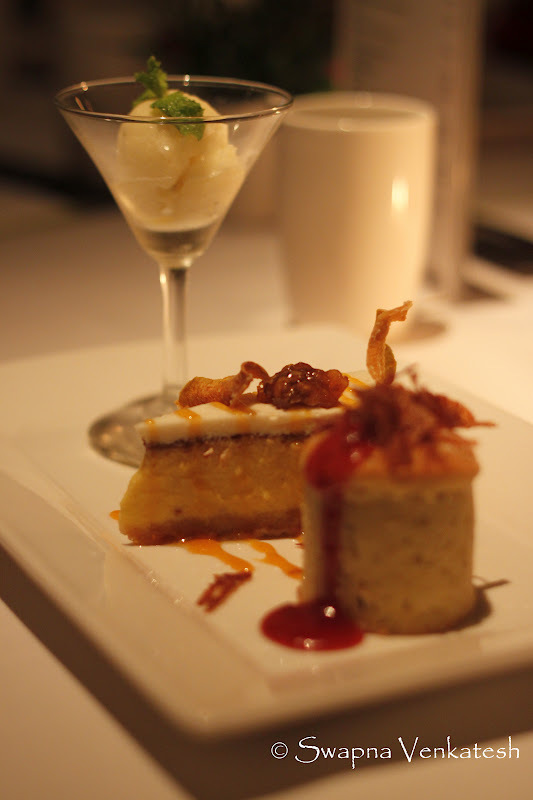 Whimsical and yummy – definitely served the purpose of making the mouth water for the courses ahead! An exquisite Carrot and Fennel Souffle was served with Almond Cream. Now I know what texture a soufflé should be – light airy and packing a flavor punch. This was followed up with three appetizers. I must mention the plating … so creative and elegant. The cooler bit being all 24 diners plates and portions looked ditto! Kudos for consistency! My favourite was the Tomato and roasted beetroot with feta cheese, argula and sherry vinaigrette. Yes, it had beetroot, but if my mom had served it to me like this when I was a kid, maybe I could have learned to stomach it! The pan tossed Asparagus, yellow bell pepper and tofu with honey Chilli glaze was the crowd pleaser. However, I must give top marks for the beautiful Avocado and mint gazpacho, followed by the innovative Avocado Cannelloni with cucumber and jalapenos. 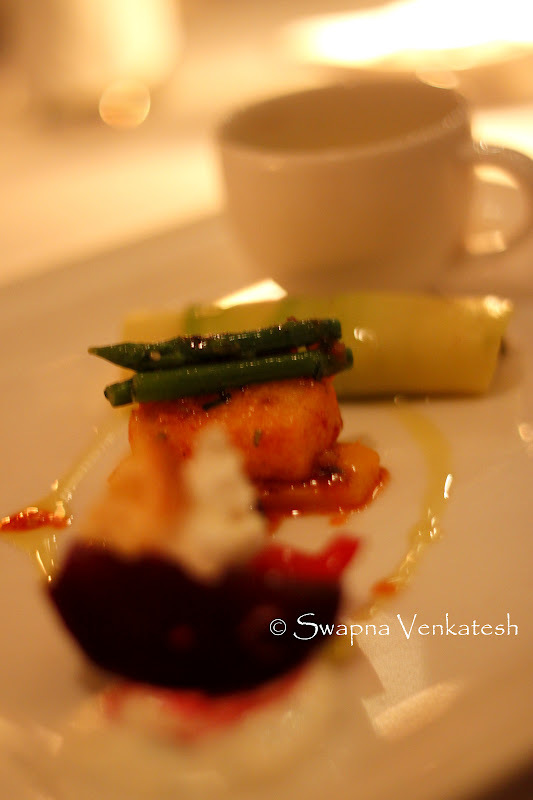 The cannelloni was made out of a never-ending thin strip of avocado, wrapped like a 60’s saree! Brilliant. For mains we had six tasting portions of innovative combos. The stars in the first platter were Cauliflower, Potato and Spinach. I know the most popular use for a cauliflower is the Gobi Manchurian, but this is gourmet darlings, so we had a Cauliflower and roast garlic risotto. To add extra pizzaz to it, was a panko crusted broccoli. Interesting, but this one paled in comparison to the other two. Now since I can’t decide which one was my favourite among these two, they both get crowned in first place. The Potato, goat cheese and onion Perogi with herb butter sauce and sour cream was divine. A Perogi is a polish version of ravioli, generally stuffed with meat. But this one was on spot nevertheless. The Spinach and ricotta Gnocchi with char-grilled vegetables and pesto rosso was so good that I had to resist using my tongue to lick the plate clean! The next batch heroes were the Bell Peppers, Mushrooms and Beans. Now I wish they had given these three main courses first. Not because they were not good, but the earlier batch stole my heart! Out of the three, we all agreed that the Ratatouille stuffed grilled Portobello mushroom and saffron polenta with garlic, chilli and Evoo was the hit maker! The polenta was perfect (most places it tastes like unsalted upma). I didn’t care much for the Mixed Beans Cassoulet, wilted spinach with tomato basil sauce – though it made for a pretty picture. The roasted red and yellow Bell Peppers stuffed with sauerkraut and feta dressed with a paprika sauce was surprisingly tasty, though by this time we all felt as stuffed as the peppers! I’m glad service slowed down for a while, so that we could indulge in some banter and get our stomachs back to eating positions. Now I was officially in a food coma, but the goodies kept coming! We were served petit fours of a mint macaroon with almond biscotti. I think I ate it … but I told you I was already in a food coma! When the waiter came in wheeling a trolly of the nitrogen stuff and started dropping some cream (?) in it I was intrigued. I don’t remember what they called it, but it turned out to be a soft airy lichee flavored mousse ball. The nitrogen quickly freezes the exterior to give it a hard shape but the insides are all quivery fun. I finally left the place. Yes, I managed to get up and get myself to the car. Man, even alcohol days have not given me such a high! 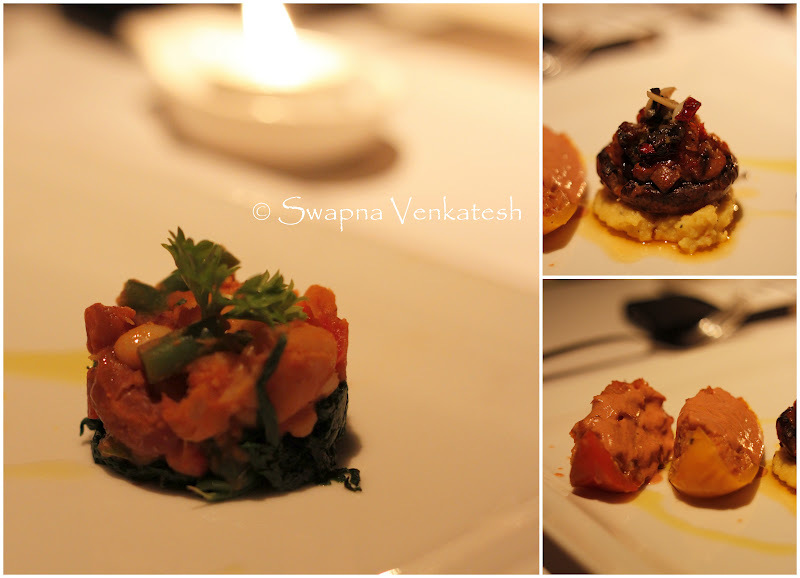 The veggies in the group could not stop raving about the experience and that includes the pretender – me! So have I converted into a Veggie now? NO. But I won’t turn up my nose at a Beetroot ever again! 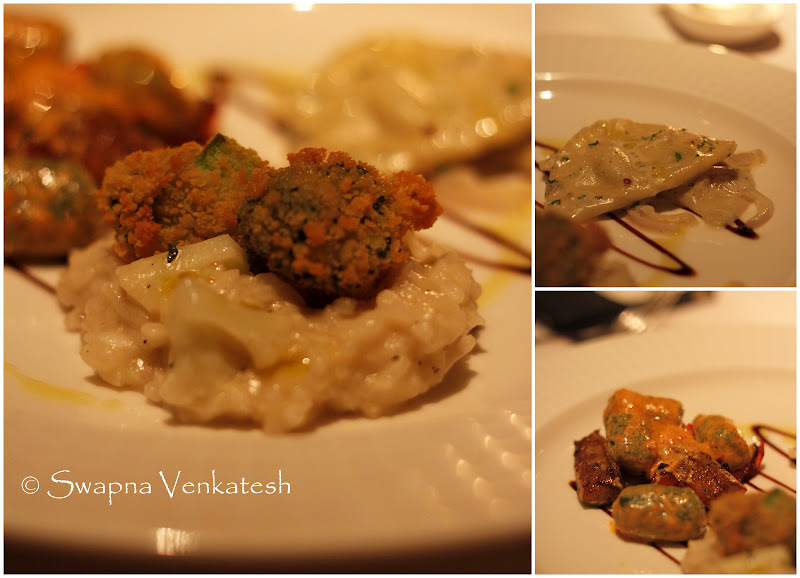 Price Point: Rs.1500/- for the special Veggie tasting menu. Rs. 325/- – Rs. 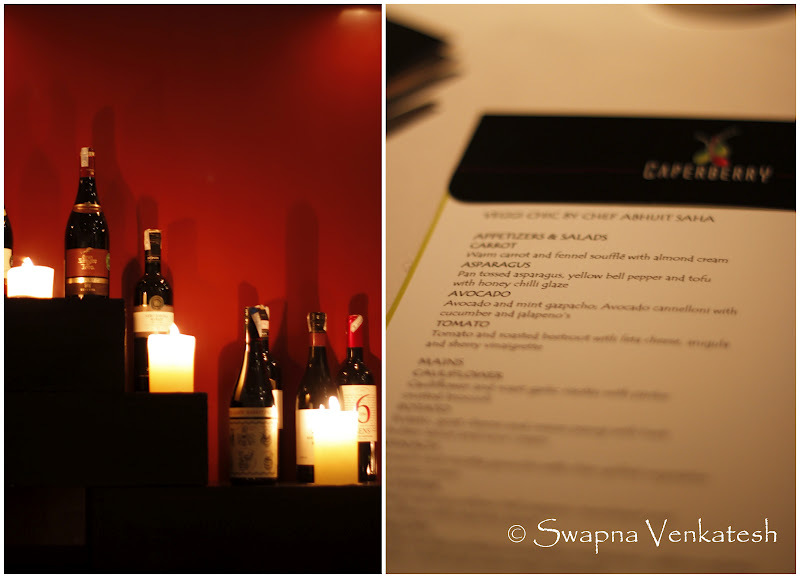 900/- for starters, mains and desserts on the regular menu. Excluding taxes and Service charge of 7.5%. Alcohol: It’s a Bar and Tapas Lounge, so yes. I should show this to veer who thinks all veg food is garbage! (thanks to conditioning from my brother)!